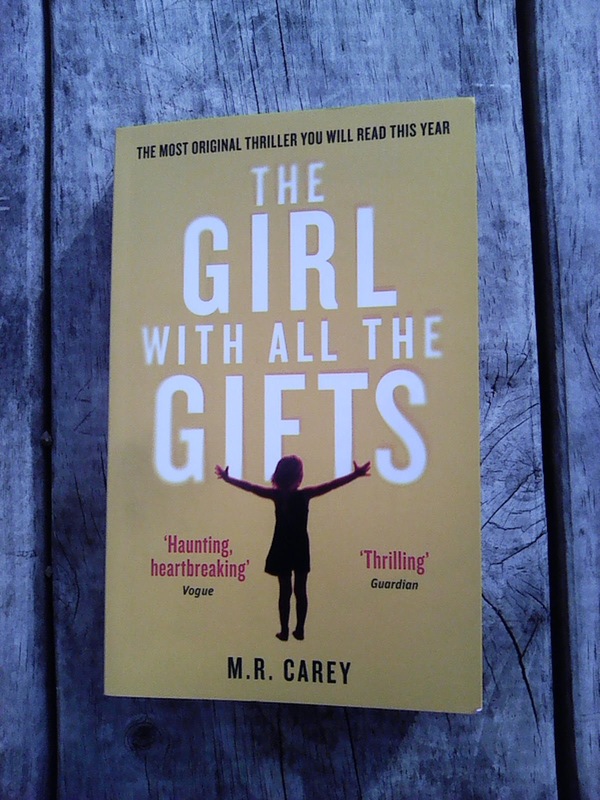 Diatonic Scale: The Girl with all the Gifts, (2014), by M R Carey. The Girl with all the Gifts, (2014), by M R Carey. 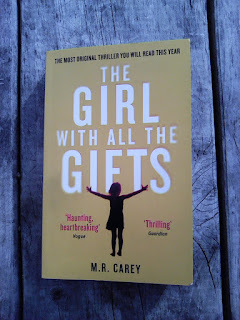 So I picked up (bought, bought not picked up, that doesn't sound right) Mr MR Careys "The Girl with all the Gifts" from Whitcoulls, published by Orbit. One of its reviewers, Jenny Colgan is quoted as "Kazuo Ishiguro meets The Walking Dead". Which to me is an interesting quote, I have questions as to why she would say that. Joss Whedon is quoted as saying "as fresh as it is terrifying", which could be sarcasm, but probably isn't, but I get why he would be a person to quote with a book such as this. According to a transcripted interview, at the back of the book, it's based on a short story that was collected in Paula Gurans Years Best Dark Fantasy & Horror Anthology (2013), Iphigenia in Aulis that had Melanie (one of the protagonists obsessed with the Illiad. There are book group questions at the back, including one which goes , "compared to Never Let Me Go by Kazuo Ishiguro how far does each book characterize children as grotesque and to be feared?". So that goes some way towards my question about that particular quote. Suspiciously so. Or not. I have to say how slick the marketing and packaging of the book is. From the short story, Mr MR Carey wrote a screen play and a novel at the same time. The cover of the book and the posters to the movie echo each other and the transcripted interview, book group questions both address that process and serve to frame the book in an intellectual manner. I am sure my thought processes are going in the direction the marketers of the book intended. The book reads like a movie, written in a passive third person perspective and until page 29 the voice is all about Melanie, the protagonist. I've seen the movies version of Melanie, from shorts played by Sennia Nanua. The books version is a "very fair" girl with blond hair and "a good girl smarminess" (page 80 : 2014) that probably channels real life cynicism. I challenge you to see the movie short and then hold onto the books version of Melanie as you read it. I gave up, but I acknowledge there could be difference. The books ending is interesting, there is enough science in the book, in the same way that there is enough science in Brahm Stokers Dracula, to legitimize the fictional narrative and it echos real life concerns. Which to be clear, was good. In my opinion, which is just another voice in the wind, a lot of progress is kind of muddling along particular paradigms and if Hegel came up with dialectical materialism it's because societies tend to oscillate from one issue to another through the generations as circumstances alter. I'm not convinced that the books ending is a happy one but it is an ending and I guess that's the point. The book was easy to read, it took me less that two days to complete but then again I'm not watching TV and I found it entertaining and liked what it did.